As Taya prepares to head home from school, Joey and Tristan are mopping up the hall as Tristan asks Joey how his sister is coping. Joey tells Tristan that the operation is going to happen any day now, but that he isn't sure if he's going to be there. Surprised at what he hears, Tristan insists that Joey go along because he wants to go as well as he thinks that Serenity is cute. As the two friends argue, Yugi calls out to Taya and asks her if she will go out with him over the weekend. Taya is surprised but pleased by the offer, but as Yugi explains that he wants her to go out with Yami she is slightly confused by the abruptness of the decision. As Sunday arrives, Yami is giving Yugi style tips as he prepares for the date, not realising what his partner has set up for him. As the two head off to meet Taya, their friend is worried about how she and Yami will get on. As Yugi arrives, he switches places with Yami, leaving his two friends alone, and the two decide to go and get coffee. As the two drink their coffee, Taya suggests that they could go to the museum and see the exhibit, explaining that one of the artifacts shown in the local paper had a symbol on it that was similar to the one on the Millennium Puzzle. As Taya worries that she may have upset Yami with her suggestion, he explains that he is worried that the paths that he and Yugi must face are going to be difficult, but Taya explains that everyone has a hard time trying to fulfil their ambition and explains to her friend about how she wants to become a dancer. Finishing their drinks, the two tour the town, visiting the music store and the park, but when Yami finds a new card shop has opened he is eager to check it out and, buying a pack of cards, is pleased to find the Hand Sealing Sword of Light inside the pack. As Taya realises that Yami is happiest when he is duelling, she decides to take him to the arcade, but as they arrive everybody is gathered around the dance machine where the talented but obnoxious Step Johnny is showing off his skills. Determined to prove her worth on the game, Taya challenges Johnny to a head-to-head dance contest, but as the music begins and the two both dance flawlessly Johnny tries to trip Taya up but only ends up falling himself. As Taya wins the contest, everyone is impressed, even Yami. Later that day, Taya and Yami are looking out over the beach as Yami realises that a dream is never worth giving up on. He explains to Taya how he longs to find his memories, but worries that when he finds them he and Yugi will become separated. However as the two continue to talk, Step Johnny arrives and challenges Taya to another contest, but this time he wants to play her at Duel Monsters. As Taya is stunned by the challenge, Yami accepts the duel in her place, but Johnny warns him that if he loses he must stay away from Taya forever. As the duel begins, Yami is determined to teach Johnny a lesson about respect for dancing, and as Johnny plays the Sound Maiden Yugi easily defeats it with the Celtic Guardian, reducing Johnny's life points to 1800. As Johnny plays his second monster, the Water Dancer, Yami realises that Johnny is using fan cards, not seriously intended for duelling but more a set of cards for collectors who like music and dancing. However as Yami passes play back to Johnny, his opponent plays the Spirit of the Harp in defence more before increasing it's DEF by 500 through the power of the Soothing Song. Surprised by the play, Yugi plays Curse of Dragon, destroying the Water Dancer and reducing Johnny's life points to 1200, but Johnny retaliates with the Witch of the Black Forest, fusing it with his Lady of Faith to form the Musician King. As the Musician King attacks, Yugi's Guardian is destroyed, reducing his life points to 1650, and as Johnny ends his turn he plays one card face down. Yugi attacks the Musician King with his Curse of Dragon, but as he does so Johnny reveals his Magic Metal Force, transforming his monster into the Heavy Metal King, destroying Yugi's Dragon. As Yugi plays the Giant Soldier of Stone in defence mode, the power of Magic Metal Force increases the Heavy Metal King's ATK to 2700 and Johnny destroys Yugi's Soldier. 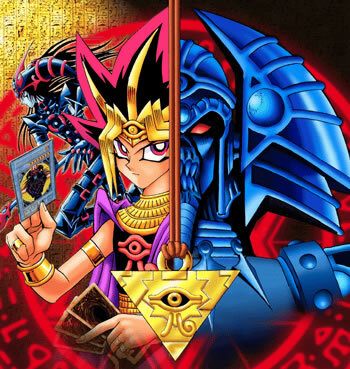 Shocked by the King's ability to increase it's ATK for each monster that it has destroyed, Yugi realises that he can still win the match as he summons the Dark Magician and orders it to attack. As Johnny reminds Yugi of his Metal Force, Yugi informs his opponent that the Trap's powers only work when Johnny is attacking, not when he is being attacked. As the Heavy Metal King is destroyed, Johnny is shocked to realise just who his opponent is and surrenders, realising that there is no way for him to win. As Johnny tries to leave the arena, Taya confronts him, telling him not to give up on his dreams. Johnny explains that he gave up trying to become a dancer when he failed an audition, but Taya tells him that he shouldn't have given up after just one try and that if he keeps on trying then he will eventually succeed. As Johnny promises to keep trying, Taya and Yami decide to visit the museum, but when the two arrive Yami is apprehensive about going in, not sure if he is ready to have his questions answered. But with Taya by his side Yami has the confidence he needs to find out who he really is. it may just be me, but Johnny Steps kinda gives off a 'DJ Professor K from Jet Set Radio Future' vibe. The dancing arcade game music is the Yu-Gi-Oh theme song sped up. Yami: "Yugi, what are you doing? This isn't a duel!" (sees Tea and straightens up.) "Oh. Hello." Johnny: Alright!! What is your name? Yami: Uhh(Thinking) Just call me Yugi! Johnny: YUGI???? The guy who beat Pegasus at his own game? Oh my god, I am out of here, I am not dueling you. Bye! Yugi: "Ready or not, Spirit, this is where you take over!" Yami: *yelling at Puzzle* "Hey! Yugi! I- You- This isn't a duel!" See's Tea "hello"
Guy watching Johnny Steps dance: I don't care how he dances, I just wnat to know how he does his hairstyle. Tea: How many friends do you have, Johnny? Tea: Really? One friend? That's one more than I thought you'd have! Jonny:You stay out of this, porcupine head! TRISTAN(To Joey)-you'd just be a third wheel. JOEY(Kicks over bucket, Angrily)-Tristan I'm gonna put YOU in da hospital. TEA-How many friends do you have. TEA-One friend thats one more than I thought you had. Although Johnny uses Metalmorph, it is the same card as the Magic Metal Force that Bandit Keith used in Duellist Kingdom. The proper name for the card is Metalmorph. The Heavy Metal King's defence is originally shown as 1700, but then increases to 1800 for no apparent reason. Johnny made it sound like the Heavy Metal King was a different monster, when technically it is just the Musician King powered up with the effect of Metalmorph. When Johnny flips Metalmorph, the Musican King's card shows that its ATK is 1800. His actual ATK is 1750. Actually Heavy Metal King's DEF should've been 1800 the incrase from 1500 to 1700 was the mistake because Metalmorph increases both ATK and DEF by 300 points.